July 11, 2008 | I’ve just brought in a flight from overseas. I’m wearing my full uniform, and have all of my gear with me. The plan is to run upstairs and leave my flight bag in the crew room before catching my commuter flight home. Unfortunately, this means having to endure “arrival screening,” one of airport security’s most irritating protocols. After clearing customs, passengers and crew alike face the X-ray line and metal detector before they’re allowed back into the concourse. 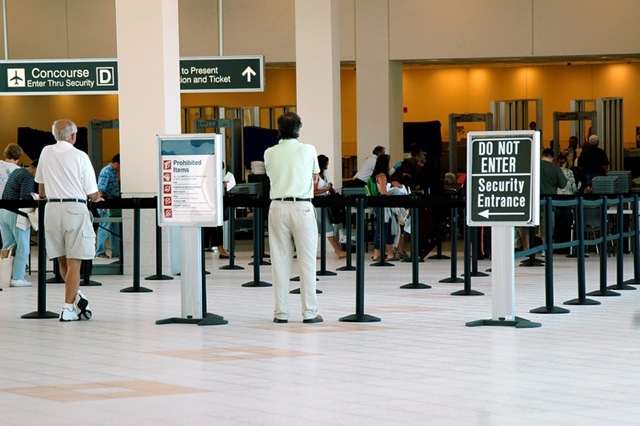 This inconvenient rule is in place because of another inconvenient rule, the one that makes connecting passengers claim and recheck their luggage when arriving from places outside the United States — even though their bags have already been screened at the point of departure. The thinking is that people could unpack this or that dangerous item from a checked suitcase — a 4-ounce bottle of shampoo, say — then carry it onto the next flight. Many share his experience of having something innocuous confiscated. And, as he writes, TSA behavior seems to be more a function of poorly trained people placed in powerful positions and acting capriciously, rather than logic. His terrorist weapon? A five-inch airline silverware knife. Travel never was relaxing for me. The logistical challenges of gauging how soon to leave home based on expected congestion of the highways and terminal; the concern over whether the flight would depart on time or be delayed; the logistical concerns regarding checking and retrieving luggage; the unease over surface connections at the arrival end. Not much fun. As the TSA added itself to the mix, and as it has steadily escalated the contortions that peaceful law-abiding citizens are subject to, travel has become even more strenuous. Like generals who are always fighting the last war, TSA’s so-called security measures have built a bureaucracy, staffed by ill-educated and inconsistently trained thugettes and thugs, adept in defending against a one-time threat, instead of expending efforts to determine the nature of likely future terrorist attacks. I am thus happy enough to be an infrequent traveler, especially for business, when maintaining some kind of custody of my employer’s vulnerable laptop only adds to the stress. And I’m a civilian. I guess I feel Patrick Smith’s pain as an airline crew member, a frequent flyer by occupation, who is subject to similar indignities, albeit in what is probably a faster moving security line. One can only hope that the next presidential administration brings back common sense when it comes to homeland security. Redirecting headcount and technology resources to such critical areas as container ports, all but ignored today, would be an excellent way to repurpose TSA. This entry was posted on Saturday, July 12th, 2008 at 6:00 pm and is filed under Aviation, Government, Terrorism. You can follow any responses to this entry through the RSS 2.0 feed. You can leave a response, or trackback from your own site.